Chewing gum belongs either in your mouth as you chew it or in the garbage to discard it. Finding chewing gum anywhere else is not an optimal situation. If you find dried chewing gum stuck in a place it does not belong, you must remove it promptly. Remove dried chewing gum from surfaces successfully with a variety of techniques. Don't let chewing gum mar surfaces when you can remove it instead. Remove dried chewing gum using a variety of techniques. Apply a generous glob of peanut butter to dried chewing gum that is in hair or on a hard household surface. Cover the surface of the gum completely with peanut butter. Work the oils of the peanut butter into the gum to loosen the attachment of the gum. Continue working at the gum as it softens and pull the gum from the surface. Wipe the surface with a soapy cloth, if appropriate for the surface, and rinse it thoroughly with plain water. Spread raw egg white over the surface of dried chewing gum. Egg white is effective for removing chewing gum stuck in hair and on a multitude of hard, household surfaces. Leave the egg white on the surface of the gum for up to 10 minutes and then begin to work at the gum with your fingers to loosen it from the surface. Continue to loosen the gum, working the egg white into the gum, until you successfully remove all traces of the gum from the surface. Place an article of clothing or a small item into the freezer when gum has dried to the item. 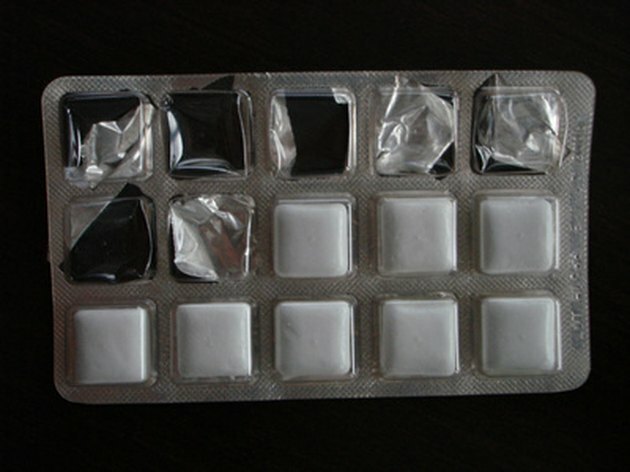 Leave the item in the freezer for up to 30 minutes until the dried chewing gum freezes completely. Remove the item from the freezer and chip the frozen gum from the object. Apply ice cubes to dried chewing gum when the item is too large to place in the freezer. Apply an ice cube directly to the chewing gum and use the ice to freeze the gum. When the gum freezes, chip the gum off the item. Spray dried gum stuck to surfaces such as metal, plastic or wood with WD-40 to saturate the gum. Wait for five to 10 minutes and then pick at the gum with your fingers to remove it from the surface. Continue working at the gum until you remove it completely.